Outstanding - Ofsted report 2017 - click to see report. And 2014! "Forest Schools were something I'd heard about through Norwegian friends so when we saw there was one starting close to us we jumped at the chance to enrol our daughter Amelie. We felt it important that Amelie should be given the opportunity and encouraged to get out, run around and get muddy-(it's good for the immune system!). 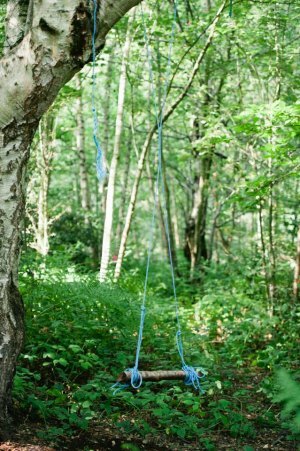 I was quite an outdoorsy child, grew up next to a farm and I would love to have done some of the activities they do at forest school! I couldn't recommend Caroline's forest kindergarten highly enough. Amelie started in January and thoroughly enjoys it. At the end of each session there's a long list of things she's done: fairy hunts, constructing dens and mud hedgehogs made to mention a few. I mustn't leave out her favourite -badge making- she's always so proud to show me, and anyone who will listen, the badge that she helped saw and colour in. Even through the cold and wet winter weather, with waterproof trousers and a few pairs of gloves Amelie keeps warm and doesn't seem at all phased by the weather- if fact she loves jumping in muddy puddles and drinking hot chocolate around the log circle! Amelie appears to be gaining a love of nature and the outdoors and is excited about Spring and seeing some baby animals! I'd also say that Amelie is definitely more active than before starting forest school, she's better a climbing and has a bit more courage in attempting new activities." "I cannot recommend Forest School highly enough. I have watched my little girl grow in confidence, find a new found love for the outdoors and nature (particularly worms and mud!) but above all, every week she comes home happy, which is the most important skill any child can learn. I have so much faith in Forest School, and Caroline, that I have taken my little one out of her 'traditional' pre-school and now she only attends Forest School. They are only little for such a short time, and what a wonderful way to spend their early years." Forest school is amazing! Since attending Yas has become more confident, her coordination has improved, her imagination is (excuse the pun) blossoming, she just loves it and so do I. It's great to know she's playing outside, in a safe environment, getting muddy, building dens, being close to nature and most importantly having FUN. She's also completely exhausted when she gets home, eats like a horse and sleeps like a baby! "FABULOUS!!! In fact when I picked my daughter up today she said 'Mama I love forest school!' The mud baths, play, den building, imagination set free :)" February 2014. "The children have flourished in the woodland; displaying cooperation, creativity, problem solving and most important high levels of enjoyment. During the latest session the children kindled wood, helped make a camp fire and had a treat of toasted marshmallows." Reception class teacher, Discovery School, Charlotte Berry. "The children of Year 2 had a wonderful afternoon in the woods. Caroline the leader from 'Forest Schools' was great with the children, kind with gentle encouragement for the children to find out things for themselves. The children explored the area, making a camp or as I was corrected a 'tank' which had guns, controls and gear stick all improvised from branches. The children were taught how to whittle safely and although it was suggested they perhaps make mobiles, it seemed bows and arrows were more exciting. The children used their imagination during the whole of the afternoon whether it was playing archenemies or climbing across great tree roots by making bridges and ladders. Many tools were used with the assistance and 'close eye' of the adults. The ring of tree stumps provided an ideal setting for teaching and reporting back at the end of the session. All the children seemed to love the afternoon and there was a lot of bonding happening, imaginative chatting and the time seemed to whiz by! I did not see one child alone and not involved." The Rev Canon Brenda Hurd, Foundation Governor, St Georges Primary School, Wrotham. "Fantastic skills being learned by exploration and experience. My son comes home from forest schools with a muddy face, and a huge grin. The skills he has learned range from starting a camp fire safely, to cooking bread over a fire, making dens, wood craft and team work." Ruth Farmer, parent and teaching assistant at St Georges Primary School, Wrotham. "Tiffany enjoyed the forest schools experience yesterday afternoon. In fact, she didn't just enjoy it, she embraced it and got down and dirty! What a fantastic learning opportunity you have given the children! Thank you once again." Mrs Rose Herridge, parent, St Georges Primary School, Wrotham. "Forest schools gives the children the opportunities to experience the great outdoors in ways they just don't anymore." Parent at St Georges Primary School, Wrotham.